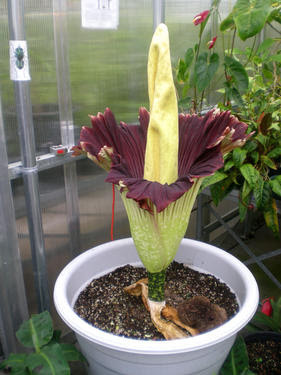 SF State's Corpse Flower Finally Blooms: "Fireworks weren't the only things busting open on the 4th of July. SF State University's resident corpse flower burst into bloom for the first time in 14 years with a pungent, patriotic display. Visitors were invited to write down what nauseating odor they felt the flower's emissions resembled; suggestions included: 'a dead rat I found in the trash,' 'trash juice,' 'rotting cabbage,' and 'my pants.' Photos by Joe Eskenazi."